Using this book in your practice will build your reputation, practice, and success. 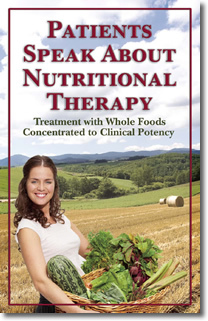 SAVE TIME: Give Patients and prospective patients a copy of Patients Speak About Nutritional Therapy. They will be educated and inspired saving you time. IMPROVE COMPLIANCE: After reading Patients Speak About Nutritional Therapy, patients will be ready for you to take charge of their nutritional supplementation program.